If you are interested in sharing your income report, just send an email to bloggingontheside@gmail.com or yourmodernfamily@gmail.com and title it INCOME REPORT. Ok… Time to get started!!! Hello! I’m JoAnn and I’ve been blogging for two years over at A Whimsicle Life. I help moms raise kids while keeping their sanity – what may seem as an impossible task. 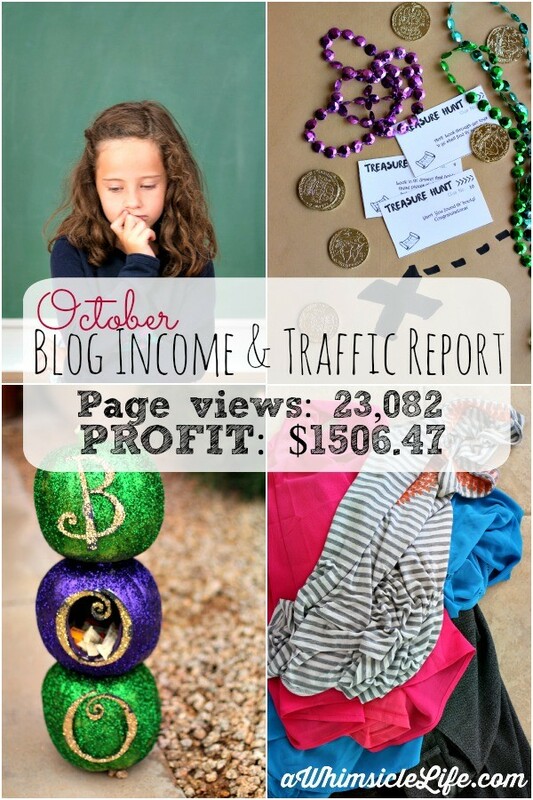 I’ve been sharing my income reports since March on my site and I am super excited to share October’s report here! Here is my monthly rundown of what went well, what tanked and what I’m working on in the future. This report focuses on prepping a product for launch and how I maintained my blog during that time. Last December, I coordinated a project involving over 70 bloggers called Countdown to Christmas. Because of the large number of participants, I split the group into three. Starting December 1st and leading up to Christmas, three bloggers shared their own Christmas related craft, activity or recipe. I chose my favorites from that project and compiled them into a book called “Christmas with Kids” – with permission of course. Since I had never created a product before, nonetheless a book, I felt that a collaborative book would be a great place to start. I thought, most of the material is already written, all I have to do it put together and make it pretty. Easy, right? No. No, it’s not easy. This book has consumed my life since June. Between learning the in’s and outs of publishing software (I compiled the book in Scrivener and formatted in Word), developing a marketing plan and then coordinating between twelve other people without stepping on toes – easy does not at all describe it. I started promoting my launch email list on October 1st by purchasing an ad on Facebook. I set my budget at $5 a day and let it roll. By the end of October, my launch email list had 50 subscribers. That number disappointed me. While I enjoyed working in Scrivener because I could easily move whole chapters and re-organize sections with ease, I grew incredibly impatient with Word. Christmas with Kids contains a lot of pictures. Many of the chapters contain step-by-step tutorials where I wanted pictures in a specific place on the page. I created a few Word hacks to work around some spacing difficulties, but overall I wanted a lot more control over my layout. For my next book, I plan to learn InDesign. Throughout my creation process, I often wondered if I was protected – particularly since I used so many other people’s work. Of course I had permission through email, but never any contract. Luckily, I attended a conference in September and got the opportunity to talk to a lawyer familiar with bloggers: the wonderful Sara F. Hawkins. She suggested I draw up a simple contract detailing what I’m using from each blogger, how they will get paid and that the copyright of the book will be in my name.Copyright?!? What? I need to copyright the book? Yes. And it was an incredibly simple process. I logged onto the Library of Congress website, uploaded my book and paid the $55 fee. Done! The copyright is in my name because if any legal dispute arises, I won’t need 13 different people to sign off on paperwork. I would represent the work as a whole. I wrote this post for one of my friends who was worried about her son. He didn’t talk about friends at school or playing with people at recess and she wondered if other kids were bullying him. I researched this for several days and compiled my findings in this post along with a personal story of my own bullying. When I posted this on my Facebook page, a lot of people shared their own bullying stories in the comments. I loved the response. Although writing this post was extremely emotional for me, I saw how sharing my heartache could inspire community and help others feel less alone. I needed a way to display Hershey’s candy in a fun way. I thought of how we always lack someone at home on Halloween to pass out candy and pitched this pumpkin stack to Social Fabric. Arizona has a wonderful community of bloggers! One amazing blogger started a group called Blockbuster bloggers where we all brainstorm a recipe, craft or activity that relates to a movie coming out. We then all publish our posts on that’s movies release date and promote each other like crazy. This post was for the movie Pan. I have a popular post called How to Create a Small Wardrobe that I’m always looking to spin off. Elaborating on a popular topic is difficult. I always have trouble thinking of an idea that is similar to the topic yet different. My husband actually suggested this post topic to me and I ran with it. My profit is huge this month in part to two three-post sponsored series getting paid. Oh happy day! Also, my affiliate income is larger than normal due to an awesome flash sale of Elite Blog Academy (of which I’m an affiliate). Usually my blog profit falls within the $10-$20 range. Oh, it’s always heartbreaking to see page views go down. I live in Phoenix, AZ. Every school break, I publish a list of places to take kids in Phoenix. I link it to posts I’ve already written in my blog and the post always blows up. It’s spectacular. The peak at the beginning of October was from my fall break post. As you can see, the page views go down as soon as fall break ends. Sad? Yes. I’m still struggling with ways to raise page views. Although I experience brief successes, I would love to have my views be more consistent. I am still learning. That is my rundown for October. Next month, I’ll let you know how the book launch went and how many copies of the book I’ve sold. This is great! I just started blogging and I’m getting around 2,000 page views a month. How did you get up to 23,000+? Thank you for sharing!! All happy (and exciting) news, Joanne! Loved reading your post. Thank you so much for sharing. I particularly liked that you shared resources that you think will make publishing easier. I also like that you shared successes as well as lessons learned. I just felt like I attended blogging university. Thank you, Becky and Paula, for sharing these. They are inspiring. HI Orlena, I get most of my sponsored posts through Social Fabric and Clever Girls Network. I’ve also been getting a few directly from the brands lately. These are from contacts that I’ve made at blogging conferences. Hi Jadie! The blogging community is awesome! And woot for Glendale! I just started a blog. How do you recommend getting views and getting started? How do I get affilaite links related to my blog? You should check out our BLOG (top menu bar) – there are so many things in there for you! 🙂 Our latest post would be the perfect place to start.